A highly adopted modern intranet acts as the gateway for a modern workplace. From employee collaboration to communications to knowledge management, intranets serve various business purposes. Just like any other technology, intranets need to be upgraded with modern features to retain employee usage and engagement. As someone who helped deploy modern intranets and intranet chatbots for numerous Fortune 500 companies, SMBs and start-ups, we created this infographic to educate you on the key developments in the intranet space. Traditional intranets with outdated features and functionalities are fast becoming obsolete. Today’s modern workplace demands a modern intranet equipped with modern features to drive better employee experience, collaboration, knowledge management and ROI. Intranet personalization enhances the way employees interact with the intranet. A robust personalization strategy will be vital to improving user experience and adoption rates. Design focus will be less on leveraging latest fads and more on getting the fundamentals right. Foundational design elements like page structure, information architecture, a streamlined look etc. will be a major focus. As the number of tools and applications increase within an enterprise, intranets will be used as a gateway for employees to access all these systems at one place. This is the next key step for intranets. As your workforce becomes more mobile, your intranet features should be optimized for a range of mobile and desktop devices. 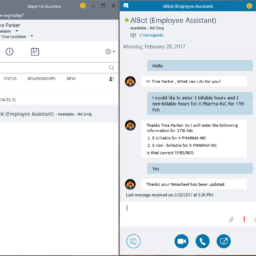 The conversational UI of a chatbot helps employees swiftly access Intranet information within the actively used messaging app and complete tasks quickly. Content updating can also be automated. Analytics tools can be leveraged to measure and analyze your intranet engagement, adoption, content, and the overall performance. Enabling enterprise search within your intranet increases the employee productivity by eliminating the hassle of switching between different apps to get the information they require. Social features and tools continue to evolve and promise a much better collaboration. New options to look for include in-depth employee profiles, personalized quick links, employee updates etc. Hub sites are the latest building block of SharePoint intranets that bring together a group of related sites, give a persistent menu navigation and improve search. Check out Acuvate’s SharePoint Intranet Solution – Mesh! Mesh is an AI-Powered modern intranet solution deployable both on on-premise and cloud environments. It is a ready to deploy solution which can go live in 4-6 weeks. Get in touch with to get a quick demo of Mesh!